Over the past few weeks I’ve been looking for new and exciting ways to exercise, as I really want an awesome beach body for Australia in February and working out at the gym just doesn’t cut it for me. 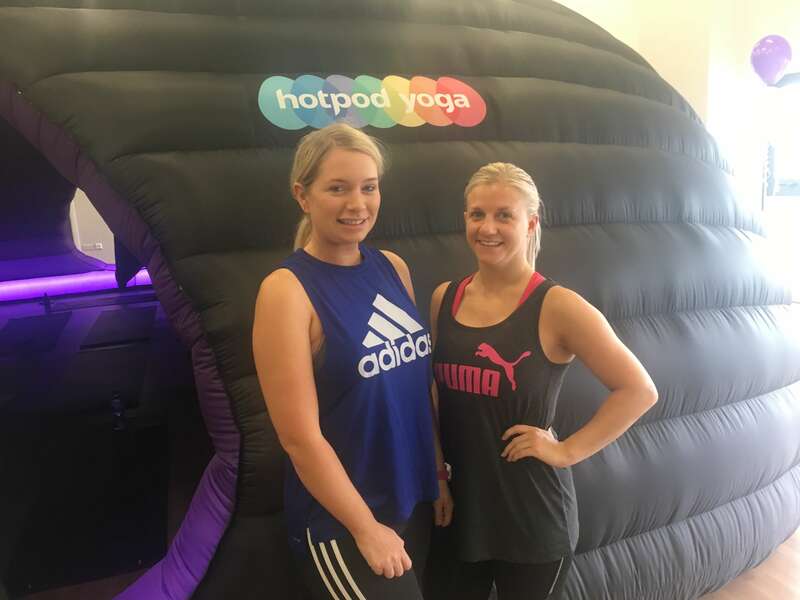 Hotpod Yoga is brand new to Chesterfield – it launched just over a week ago – and I was so pleased when I saw it on Facebook, as I’ve been wanting to try it out for a while but Derby and Nottingham are a little far to go for an exercise class. My bestie and I tried out a class last Sunday. The 20 person pod is located at the Proact Stadium where Chesterfield FC play which is a really convenient venue, being just on the edge of town and right next to big Tesco. There’s also plenty of free parking there and with the stadium being quite new, it’s really clean and modern. There are also showers at the venue which, as you’ll find out, is quite a big plus point. I’ve done yoga quite a bit before as we used to have a lunchtime yoga session at work but this was quite a bit of a step up for me and felt a little more challenging than yoga I’d done before, which is great for any work out in my eyes – I like to feel like I’ve been working hard! It’s flow yoga which means you’re constantly moving from one position to another and the pod is heated to 37 degrees which means it gets pretty toasty in there! If you think yoga’s a little too spiritual for you, think again! Hotpod Yoga is grounded in reality and so it suitable for every type of body and every mind. And no, it’s not just for girls! Boys, you’ll find it a great workout too, especially if you’re used to playing lots of sport, as it can help to loosen up and stretch your muscles out. A towel and a drink are a must – I’m not a sweaty person usually but I was absolutely dripping by the end of the class! Leave your make-up behind too (like we did!) – you don’t want to end up with panda eyes! Amy, the yoga teacher was lovely and there was no pressure if you couldn’t contort your body into all sorts of shapes (thank you short hamstrings!) as there are different levels to go to depending on what feels good for you. All in all it was a really fun workout class which we’ll definitely be regulars at. Readers of my blog can get their first Hotpod Yoga session for free in Chesterfield. Just visit the Hotpod Yoga Chesterfield website here, select one class pass from the class pass section and use code HPYCOCOFREE to check out. You can then check in to a class of your choice. Already tried Hotpod Yoga? Let me know what you thought in the comments! I’ve heard a lot about Hotpod Yoga recently and I’ve been really interested to see if it would really be for me. You’ve definitely persuaded me to give it a go, I’m a total novice when it comes to yoga but I think it could be good fun and quite beneficial for me! I definitely found it a really good workout and a good giggle too! Let me know how you get on!